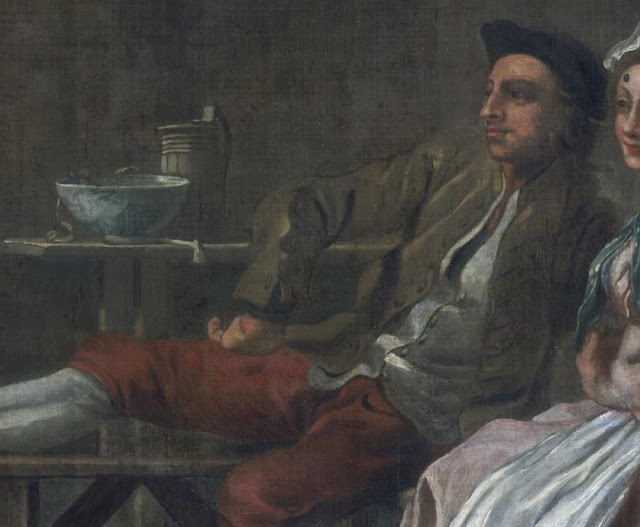 Today's guest post comes from Christopher P. Magra, Professor of Early American History at the University of Tennessee and an expert on naval impressment. His new book Poseidon's Curse: British Naval Impressment and Atlantic Origins of the American Revolution is available for sale now, and British Tars: 1740-1790 readers can get 20% by following this link. 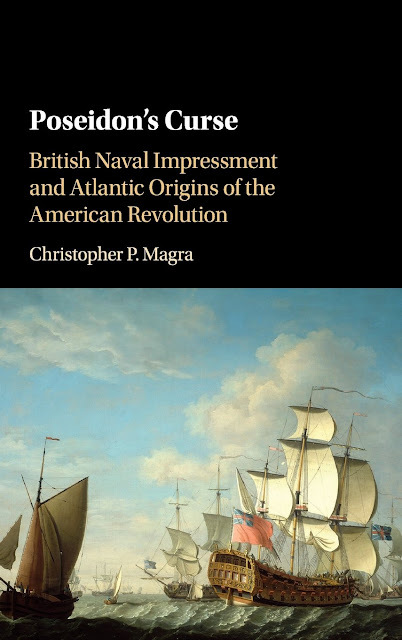 Cambridge University Press published my new book, Poseidon’s Curse, which explains the longue durée, semi-global dimensions of the American Revolution. I spent ten years doing archival research for this book. I hope you will give it a read. In the meantime, enjoy the abstract below. Parliament made it legal for the British navy to press mariners and ships into military service in North America in 1775. A 1708 law banned naval impressment in this part of Britain’s seaborne empire. But, this ban had become 'prejudicial' to the British navy, as it 'proved an Encouragement to Mariners belonging thereto to desert in Time of War, or at the Appearance of a War, to the British Plantations on the said Continent of America.' 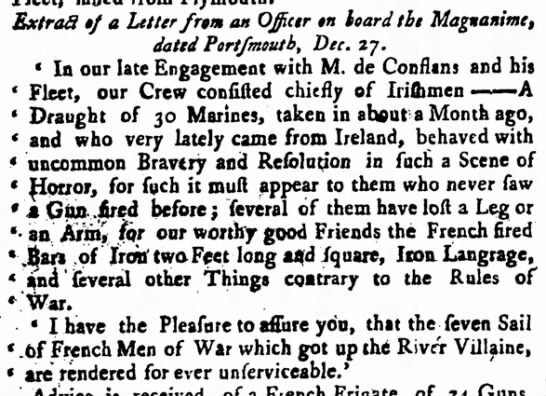 The British navy was short on volunteers throughout the early modern era. Desertion remained an additional manning problem. And the navy needed commercial ships for troop transport, message delivery, and special assignment, as well. News of the 1775 legislation spread very quickly across the Atlantic Ocean. American newspapers printed detailed descriptions. Colonial readers learned that the Crown and Parliament had expressed their willingness to do everything in their power to force Americans to comply with the new law. There was an immediate context for this grievance. By 30 June 1775, there were twenty-nine British warships stationed off the North America coast between Florida and Nova Scotia. These warships carried a total of 584 guns and 3,915 men. 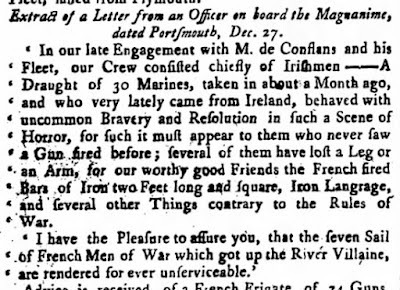 By 9 October 1775, another six warships patrolled North America’s coastline in an effort to suppress rebellion along the waterfront. The commanding officer, Vice Admiral Samuel Graves, resorted to impressment to accomplish this mission. At Boston on 20 February 1775, he explained to the Admiralty, 'Necessity obliges me, contrary to my inclination, to use this method to man the King’s Ships.' He reported that 'The Ships with me at Boston are beginning to be sickly, they have lately lost several men by deaths, and as desertions happen, notwithstanding the utmost care is taken to prevent it,' he had ordered press gangs to do their work along the eastern seaboard. Americans that read and heard the Declaration would have understood that Graves’ gangs had taken men and made them fight their neighbors. There also existed a longer and geographically expansive context for this grievance. The British navy had been pressing mariners and commercial vessels around the Atlantic Ocean for over one hundred years by 1776. It had 'constrained' a lot of people, not just Americans, and not only maritime laborers. The Atlantic approach to studying the past that I use in Poseidon’s Curse helps me bring this deeper context to the surface. There were Britons living and working along the coast of Africa, in the British Isles, in the Caribbean, and on the eastern seaboard of North America who resented the ways in which press gangs constrained their economic freedoms. Maritime entrepreneurs, including merchants and ship owners who charged freight rates to transport goods, believed the state appropriation of ships and maritime laborers posed a threat to profit margins. There was a great deal of profit to be made in shipping lucrative commodities such as dried, salted cod, slaves, sugar, and tobacco long-distance to overseas markets. Impressment elevated labor costs, which shrunk profit margins. It also delayed, disrupted, and destroyed maritime commerce. The requisitioning of privately owned commercial vessels led to property damage and temporary and permanent forms of property loss. Members of the British Atlantic business community closely linked the preservation of their private property rights and their ability to maximize profits with their political liberty. By the eighteenth century, employment options and earnings had become vital to maritime laborers and their families. They viewed them as necessary survival mechanisms in a capitalist system. They may not have loved them, any more than they had love for competitive labor markets, but they found them necessary. Moreover, they associated these economic freedoms with their political liberty. 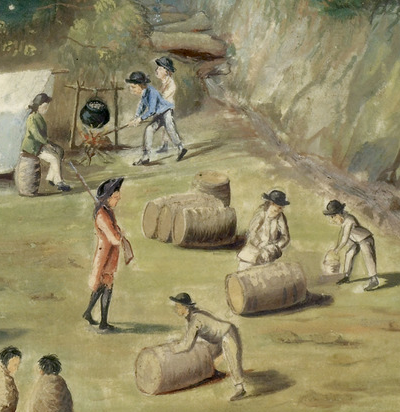 Impressment curtailed these freedoms without providing workers with a viable alternative. The American Revolution was moored in this deep and wide sea of shared resentment. Having said this, Americans felt especially constrained. Though press gangs were most active in Great Britain, they were the most highly regulated there. The British government established the Impress Service for coastal communities in the British Isles during the eighteenth century to ameliorate the harsh effects of naval impressment. The Admiralty stationed regulating captains in coastal communities and set up rendezvous points to carefully process pressed men. This was explicitly done to limit the threat to Britons’ liberties. Between 1746 and 1775, Parliament permanently banned impressment on and around Newfoundland and Caribbean island colonies to encourage commerce and safeguard economic and political freedoms in these areas. Americans were jealous about the encouragement the British government bestowed upon other colonists in the Atlantic World. They were also particularly anxious about the implications of this imperial favor. They feared that it meant Americans would support the expansion and maintenance of Britain’s seaborne empire at their own expense. There were Americans who believed they were being unduly constrained, while others were allowed to prosper. The Revolution was moored in these particular concerns that were unique to North America. The American Revolution was not solely the result of frontier land disputes or even just events in North America. There was demand for naval protection along the four corners of the Atlantic Ocean and across shipping lanes. The British navy pressed mariners and commercial vessels into military service to provide this protection. The British government deemed military force necessary for the elaboration and maintenance of overseas colonies and trade. The state appropriation of free labor and private property generated widespread resentment among business owners and workers. Britons on both sides of the Atlantic Ocean wanted the benefits of a seaborne empire without too many costs. They sent anti-impressment signals to Parliament. The British government decided to favor certain Atlantic interests over others. These decisions incentivized the behavior of stakeholders who defended the imperial system. They motivated colonists who were not beneficiaries to want to leave that system. Events on and around the Atlantic World shaped the contours of the imperial crisis. The state appropriation of free labor and private property played an important role in the decline of Britain’s seaborne empire. These constraints helped convince colonists that there were imperial chains that needed to be cast off. 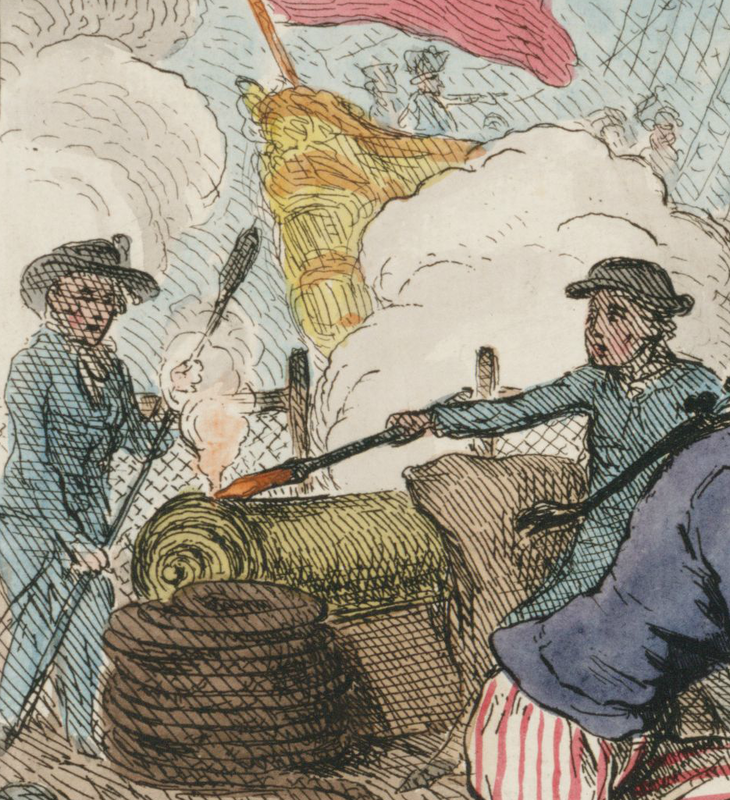 Colonial American merchants and mariners resented the ways in which press gangs negatively impacted their living standards and their economic freedoms. 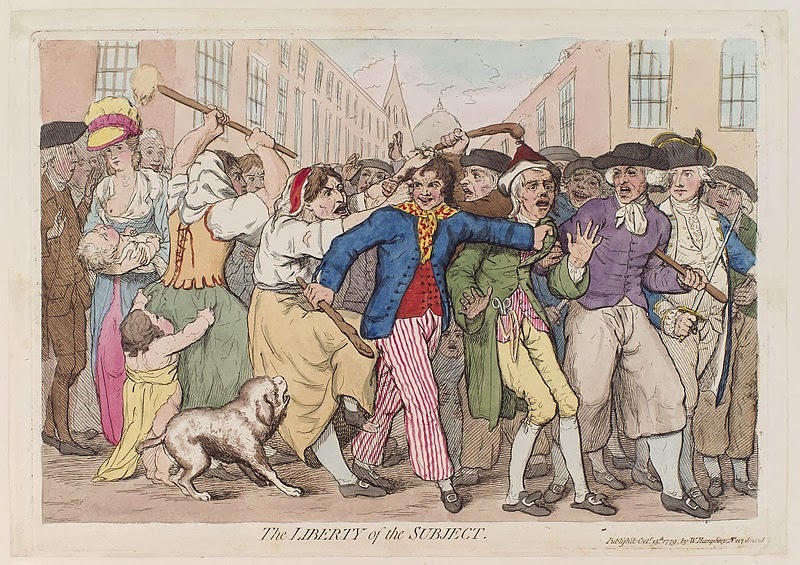 A mid-eighteenth-century shift in Britain’s blue water policy and impressment legislation in 1708, 1746, and 1775 converted this resentment into rebellion. Alexis de Tocqueville captured Americans’ sense of being constrained within Britain’s seaborne empire. He wrote, 'The Declaration of Independence broke the commercial restrictions which united them to England, and gave a fresh and powerful stimulus to their maritime genius.' Of course, Americans still had work to do to free themselves from British naval impressment. It took the War of 1812 to finally lift that constraint. 15 George III, c. 31. 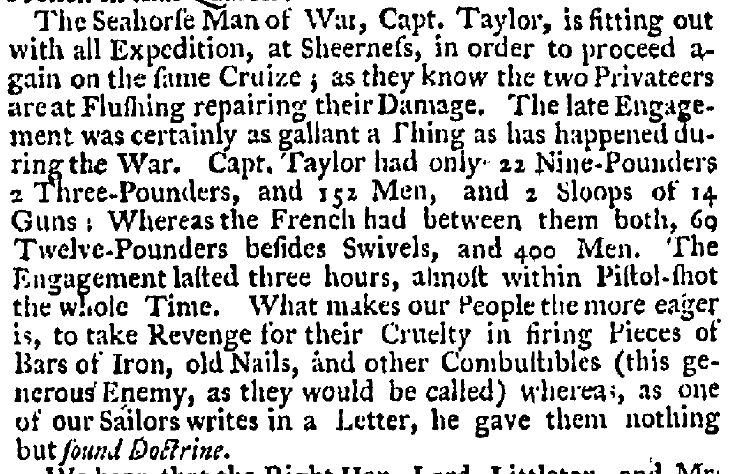 See, for example, Boston Evening Post, 3 April 1775 and 10 April 1775. William Tudor to John Adams, 4 April 1775. Papers of John Adams, Digital Edition, Massachusetts Historical Society, http://www.masshist.org/publications/apde2/view?id=ADMS-06-02-02-0086. 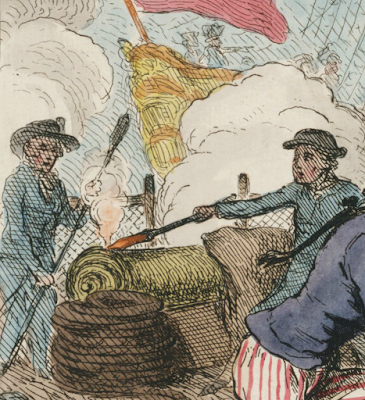 American Archives, documents of the American Revolution, 1774-76, http://amarch.lib.niu.edu/redirect, Series 4, Vol. 5, 472. The Declaration of Independence, http://www.loc.gov/rr/program/bib/ourdocs/DeclarInd.html. “Vice Admiral Samuel Graves to General Thomas Gage,” Boston, June 30, 1775, William Bell Clark, et al., eds. Naval Documents of the American Revolution (Washington, D.C.: U.S. Government Printing Office, 1964-), (hereafter NDAR) Vol. 1, 785. The National Archives, Kew, England, Records of the Colonial Office, 5/122/35. NDAR I:98. Vice Admiral Samuel Graves to Admiralty Secretary Philip Stephens, 20 February 1775. For evidence that Graves continued to order the captains under his command to press Americans, see NDAR I:177. 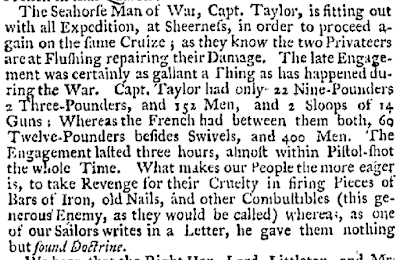 On 24 June 1775 the Admiralty acknowledged “that many of your Ships are considerably short of their Compliment of Men. 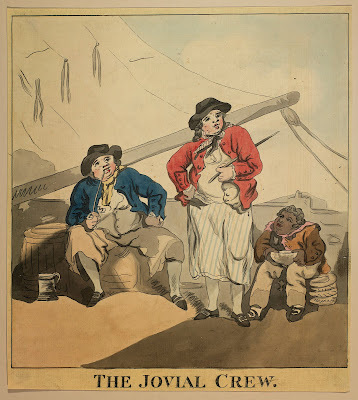 And that there is no likelihood of making up the deficiency by Volunteers.” They sent Graves press warrants “empowering the Officers of the Ships of your Squadron to Impress such a Number of Seamen & Seafaring Men as may be necessary to complete their respective Compliments. The Clause of the Act of the 6th of Queen Anne which forbid the impressing of Seamen in America being repealed by an Act passed in the last Session of Parliament as you will see by the enclosed Copy which I send you.” NDAR I:492. Stephens to Graves, 24 June 1775. Other Atlantic approaches to the study of the American Revolution include Janet Polasky, Revolutions Without Borders: The Call to Liberty in the Atlantic World (Yale University Press, 2015); David Armitage, “The First Atlantic Crisis: The American Revolution,” in Philip D. Morgan and Molly A. Warsh, eds., Early North America in Global Perspective (New York: Routledge, 2014): 309-336; David Armitage, “The American Revolution in Atlantic Perspective,” in Nicholas Canny and Philip Morgan, eds., The Oxford Handbook of the Atlantic World, 1450-1850 (Oxford University Press, 2011): 516-532; Thomas Bender, Laurent Dubois, and Richard Rabinowitz, eds., Revolution! : The Atlantic World Reborn (New York: Giles, 2011); and Wim Klooster, Revolutions In the Atlantic World (New York University Press, 2009). None of this scholarship on the origins of the Revolution focuses on naval matters. Alexis de Tocqueville, Democracy In America, edited by Bruce Frohnen (New York: Gateway Editions, 2003), 333. Everyone's got to eat. It's as universal as death and sleep. MESS, a particular company of the officers or crew of a ship, who eat, drink, and associate together. MESS-MATE, a companion or associate of the above division. The Steward makes a fresh mess-book every month, so that the men can change their mess-mates, as often as they please; and when he serves their beef or pork, he calls forward one day and backward the next, to give them an equal chance of time to eat it. Messmates were self selecting. This meant that sailors chose which companions to spend time with, and which they could avoid. By giving sailors the opportunity to change their messmates about once a month, officers gave them the agency to reduce shipboard conflict. For common sailors, messmates were family. Olaudah Equiano devoted pages of his Interesting Narrative to one of his closest friends. A young enslaved African held aboard the Aetna in 1760, Equiano's upbringing, education, ambitions, and beliefs were entirely different from his European shipmates. Among them, 'there was also one Daniel Queen, about forty years of age, a man very well educated, who messed with me on board this ship.' Queen taught Equiano how to shave and read, and gave him instruction in Christianity. In short, he was like a father to me; and some even used to call me after his name; they also styled me the black Christian. Indeed I almost loved him with the affection of a son. Many things I have denied myself that he might have them; and when I used to play at marbles or any other game, and won a few halfpence, or got any little money, which I sometimes did, for shaving any one, I used to buy him a little sugar or tobacco, as far as my stock of money would go. He used to say, that he and I never should part; and that when our ship was paid off, as I was as free as himself or any other man on board, he would instruct me in his business, by which I might gain a good livelihood. This gave me new life and spirits; and my heart burned within me, while I thought the time long till I obtained my freedom. The poor fellow begg'd to speak with his messmate, who went to him, and he told him he should soon be dead, and he would leave him his pay which was due. Jemmat's tale was fictional, but this sort of comfort and care was common among the brotherhood of mariners. Finding a spot in a welcoming mess was essential to social survival at sea. In Hannah Snell's authorized 1750 biography The Female Soldier, the ghost writer states that 'as she was very tractable, sprightly, and wiling, she soon was caressed by her messmates, for whom she would very readily either wash or mend their linen, or stand cook, as occasion required.' By leveraging her skills learned ashore as a woman to relieve men of their more feminine tasks, Snell carved out a place in the mess and assured herself a niche in the Wooden World. Messmates were central to sailors' lives. So much so that perhaps the strange practice of frying watches was an extension of the mess ashore. The ceremonial practice of frying watches was a communal activity in which a small group of sailors would participate, and that small group was most likely a mess. When the pudings ware nearly done, before dinner, in the coppers, they would send a line from the fore top, and one hook on a large pudding, and up it would fly in an instant, and in less than five minutes it would be devoured. When they piped to dinner, purhaps six in a mess come to look for there pudding, had nothing to eat, though if detected they would be punished. In the meantime the poor soldiers ware 6 men upon 4 mens allowance. When going for their peas at dinner, with a large bowl full, and the ship rolling, away they went into the see scuppers, and the peas gone for the whole mess. There was no pity, but all hands laughing at each other. 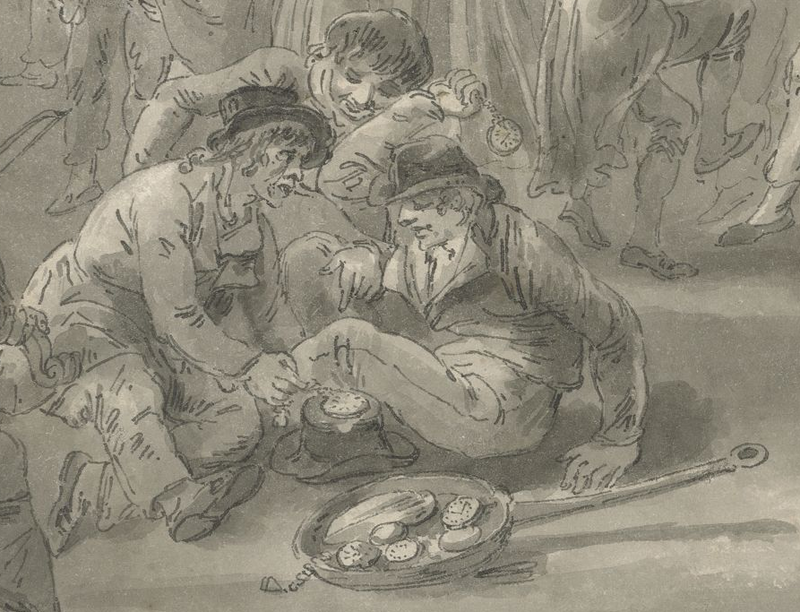 The seamen would go to the steward and get a bowlful of oatmeal and make a cake of it and bake it in the hot ashes till it was done and sell it to the poor fellows for six mens allowance of wine, which was three pints. I then pointed to him from his own book the names of several heads of messes which I knew was not complete in their numbers, and he had granted to every mess six rations. We then went to one which he had granted six rations, and he had but one beside himself. There was four rations per day lost in one mess. He then asked him to name all in his mess as he had done to him before. 'There is Tom and myself is two, and there is John, 3, Josephes, 4, John Josephes Joe, 5, and Portuguese Joe, 5.' His name was John Josephes Joe, a Portuguese. He added four names to himself when there was but two in the mess...A similar deception was found in several of the other messes but not to that extent. Generally, a mess would send a single member to collect the food for the entire mess, which may have been shared out of a single bowl or plate. 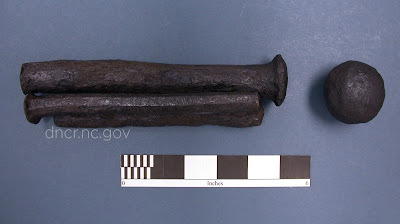 Sailors appear to have individually owned their utensils, as several excavations have turned up pewter spoons carved with the initials of common sailors. Given the size of staved tankards from the period, these may also have been shared among the mess. Officers also had to prevent theft between the messes. The cliques created by the mess system encouraged rivalries between them, which might contribute to shipboard conflict. The Massachusetts privateer Defence, sunk in 1779, appears to have instituted a system to combat this. Shelley Owen Smith included an illustration of mess tags in the 1986 doctorate dissertation The Defence: Life at Sea as Reflected in an Archaeological Assemblage from an Eighteenth Century Privateer. Small wooden tags found in the galley area also carry initials and markings. 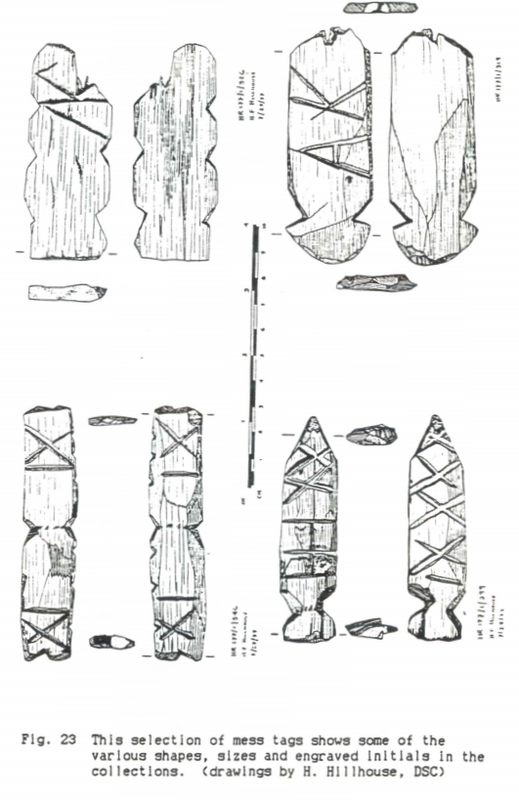 Thought at first to be gaming pieces,the tags - some carved to resemble projectile points - are now known to have been used to designate a particular mess section of six or seven seamen. With string a tag was tied to a chunk of meat to be boiled down in the galley stove cauldron with the tag hanging over the side. At mess call, the "captain" of a mess section went to the galley with a kid and by means of the tag identified his portion which was carried back to be shared with his mess mates. In exploring the mess system, we see the contradictory nature of sailors' social lives. They were intensely personal and nearly familial in their care for one another, but could just as easily victimize anyone outside their overlapping circles of social connection. The mess system allowed sailors to cross incredible gulfs of cultural difference, while at the same time enabling them to take advantage of their shipmates. As with most of the sailors' world, the mess system reveals a contradictory society of conflict and acceptance. 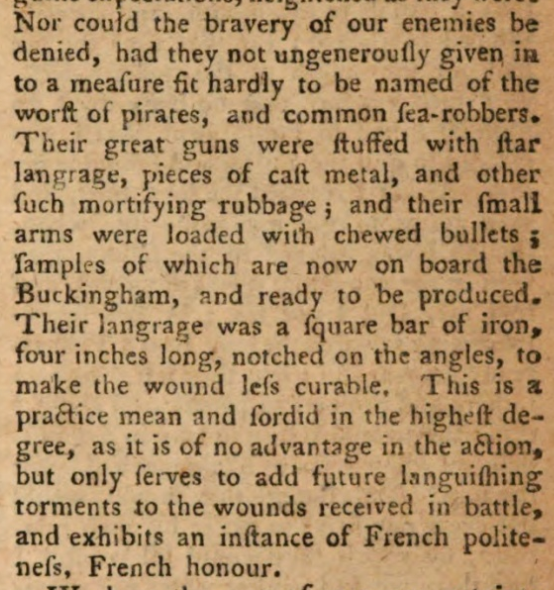 Falconer, William, An Universal Dictionary of the Marine, London: T. Cadell, 1780, page 184, University of California Libraries via Internet Archive, accessed March 9, 2019, <https://archive.org/details/universaldiction00falc/page/n205>. Spavens, William, Memoirs of a Seafaring Life: The Narrative of William Spavens, edited by N.A.M. Rodger, County Somerset: The Bath Press, 2000, page 107. Equiano, Olaudah, The Interesting Narrative and Other Writings, edited by Vincent Carretta, New York: Penguin, 2003, pages 91-92; Carretta states that the pay book of the Aetna that 'Daniel Queen' was listed as 'Daniel Quin, able seaman', footnote page 266. Jemmat, Catherine, The Memoirs of Mrs. Catherine Jemmat, Volume II, London: publisher unknown, 1765, page 88, via Google Books, accessed March 12, 2019, <https://books.google.com/books?id=LXwEAAAAYAAJ&dq>. Nagle, Jacob, The Nagle Journal: A Diary of the Life of Jacob Nagle, Sailor, from the Year 1775 to 1841, edited by John C. Dann, New York: Weidenfield & Nicolson, 1988, page 73. 'Will of William Bicknell, Master Sailmaker of His Majesty’s Ship Richmond,' UK National Archives, 22 June 1764, PRO 11/899/393. Prince, Christopher, The Autobiography of a Yankee Mariner: Christopher Prince and the American Revolution, edited by Michael J. Crawford, Washington, D.C.: Brassey's Inc., 2002, page 129.
 e.g. Bingeman, John H., The First Invincible (1747-1758): Her Excavations (1980-1991), Oxford: Oxbow Books, 2010, page 164-166; 'The Excavation of the Privateer Defence,' Northeast Historical Archaeology, Volume 12, 1983, page 46, via Binghampton University, The Open Repository, accessed March 9, 2019, <https://orb.binghamton.edu/cgi/viewcontent.cgi?article=1297&context=neha>. Owen Smith, Shelley, The Defence: Life at Sea as Reflected in an Archaeological Assemblage from an Eighteenth Century Privateer, doctorate dissertation, University of Pennsylvania, 1986, page 63. 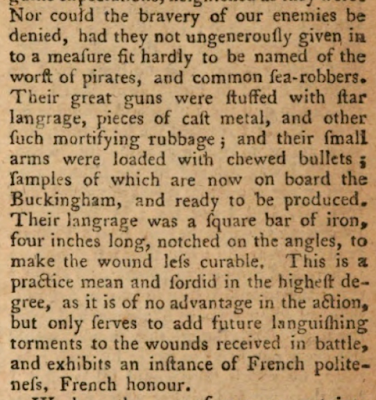 Switzer, 'Excavation of the Privateer Defence,' page 48.